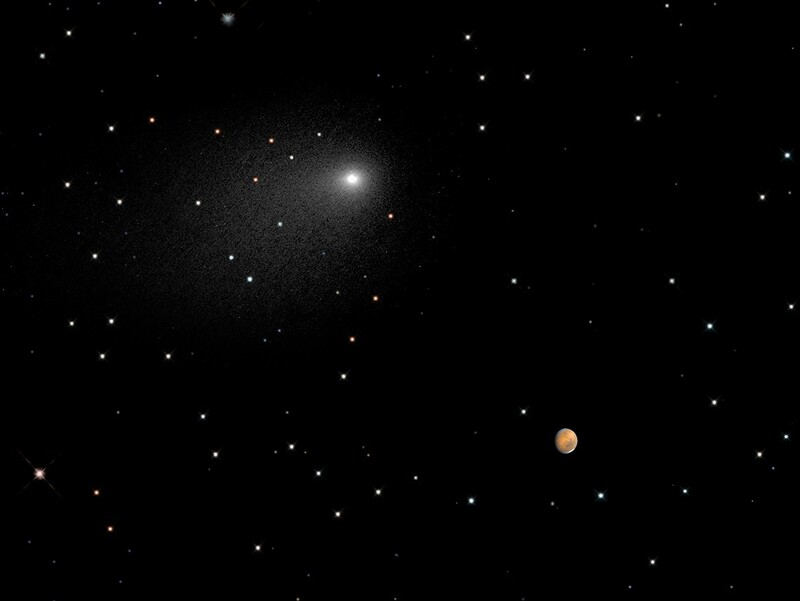 Siding Spring, officially designated Comet C/2013 A1, made its closest approach to Mars at 18:28h GMT on 19th October 2014, at a distance of approximately 87,000 miles. That is about one-third of the distance between Earth and the moon. At that time, the comet and Mars were about 149 million miles from Earth. The comet image is a composite of Hubble exposures taken between 18th October at 08:06h to 19th October at 23:17h. Hubble took a separate image of Mars at 22:37h on 18th October. NASA used its extensive fleet of science assets, particularly those orbiting and roving Mars, to image and study this once-in-a-lifetime comet fly-by. 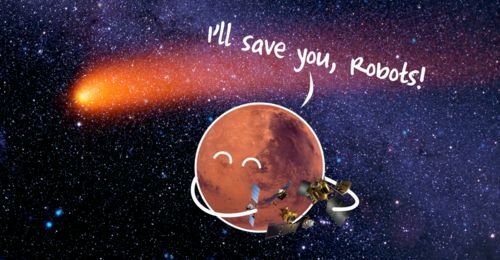 In preparation, NASA maneuvered its Mars Odyssey orbiter, Mars Reconnaissance Orbiter (MRO), and the newest member of the Mars fleet, Mars Atmosphere and Volatile EvolutioN (MAVEN), in order to reduce the risk of impact with high-velocity dust particles coming off the comet. Other NASA space observatories also joined Hubble in observing the encounter, along with ground-based telescopes on Earth. The new composite image was taken with Hubble’s Wide Field Camera 3. Last up, here's a picture of Comet Siding Spring taken from the Siding Spring Observatory in Australia where the comet was discovered, and from which the comet takes its name. 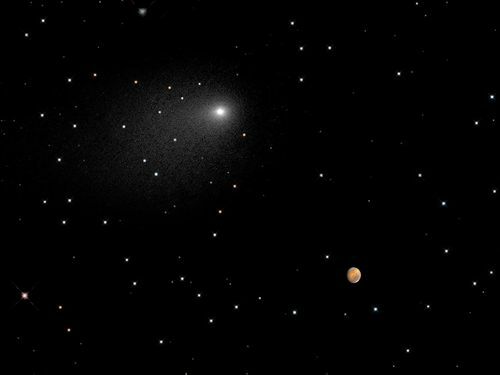 It was taken by astrophotographer Damian Peach, using a robotic 20" telescope, and shows Mars (upper right) and Comet Siding Spring (lower left). 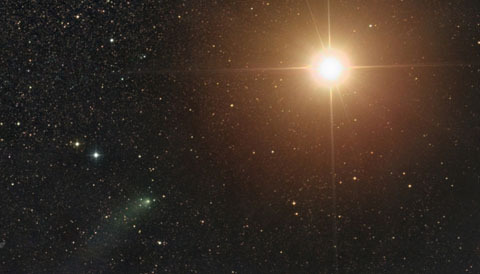 As the comet is only Magnitude 12, Mars outshines it by about 10,000 times.